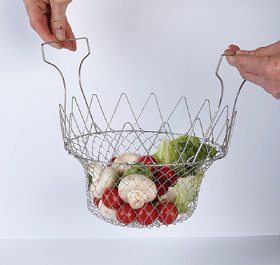 The chef’s basket is a versatile multi-function kitchen utensil from Creative Products. Made from tough stainless steel, the fold-flat, easy store, compact design quickly expands into a flexible basket that lets you cook, boil and deep fry foods with ease. When the chef’s basket is inverted it turns into an over-pan steamer for all types of steamed food and vegetables. The handles are specially designed to stay cool to the touch even in boiling water. When your food is ready, simply lift straight from the pot to your serving plate or dish. Flip down the handles and it’s a free-standing colander, ideal for washing, rinsing and straining; SRP £6.99.